Michael has worked in a variety of capacities in the behavioral health field since 1991, treating both mental health and substance use disorders. 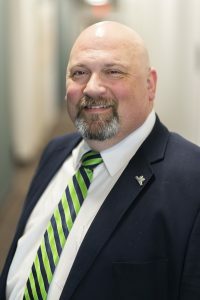 In addition to his work at PROACT, he serves on the faculties of Eastern Kentucky University and the Kentucky Community and Technical College System, where he teaches classes in addiction counseling and social work. Michael also currently serves as Secretary on the Board of Directors for the Fuller Center for Housing of Ashland and Ironton, Inc.
Michael is a past Clinical Director for Prestera’s Addiction Recovery Center, Director of Behavioral Health for Our Lady of Bellefonte Hospital, and Addiction Program Supervisor at Pathways, Inc. Michael has a Master’s Degree in Social Work from the University of Kentucky and is licensed to practice independently in both West Virginia and Kentucky.